Outdoor game is interesting for those people who want to refresh their busy day. The people try to disappear their bored in daily activity and enjoy their holiday in outdoor activity. Find an interesting game to support your joy. Like people in the picture above. 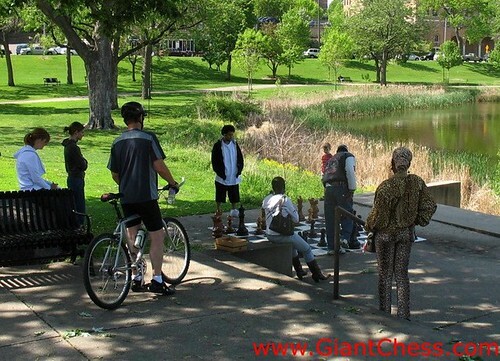 Having chess game beside a pool, located in public garden area. Those people use giant chess set pieces that made from wooden material and use chess board which support the big chess pieces. Are you interesting to outdoor game like those people? You've come to the right place. We provide many kind of outdoor game equipment. We have chess set in various size, checker set in various set, giant dart, giant wooden stone and many more. All of our product has made from best quality of Teak wood and carved by our expert craftsman. Choose your favorite one and get it now! !